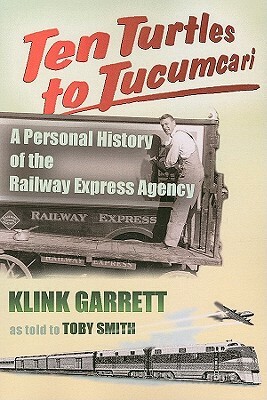 From its founding in 1929, Railway Express Agency dominated the transportation industry until the 1960s. In return for a monopoly on passenger train service, the express company was obligated to accept any and all shipments within the United States. REA handled carloads of cattle, race horses, and fruits and vegetables. Radioactive material was moved on regular schedules for the Atomic Energy Commission. When companies or individuals wanted to ship something (even ten turtles) to any place in the world (even Tucumcari, New Mexico), they called REA. The history of REA coincides with the career of Klink Garrett, who began as a temporary employee in Rapid City, South Dakota, in 1934 and stayed with REA until 1973, by which time he was a senior executive and member of the company's board of directors. Garrett spent the first half of his tenure working in small offices, usually one-man operations, in the West. In 1956 he was promoted to a national sales position with offices in both New York City and Washington, D.C. His main job was to coordinate the transportation needs of the Defense Department and the emerging nuclear industry via REA. His entrepreneurial ethic--a combination of extraordinary customer service and good old-fashioned ingenuity--gave him lots of good stories to tell, many of which are related here. His last fifteen years at REA were the years of the company's decline and the decline of the nation's railroads; by 1976 the company was bankrupt and out of business.